Skid Steer Tires By Size. Whether you are looking for common skid steer tires or less common skid steer tire sizes, you can trust MonsterTires.com to find what you are looking for. At MonsterTires.com, we carry a large selection of Skid Steer Tires by Size. 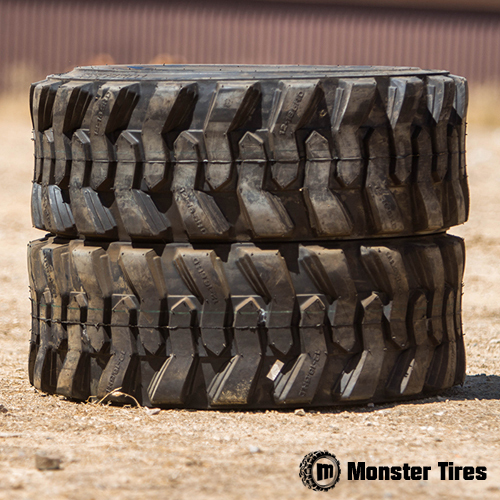 From 10X16.5 to 12X16.5 and 14X17.5 + Many Tread Options, you can trust that MonsterTires.com will get you the skid steer tires you need for your equipment today. If you are looking for Solid Skid Steer Tires, take a look at our Solid Smooth Skid Steer Tires or our Solid Traction Skid Steer Tires. Below, you will find a wide variety of pneumatic skid steer tires with many different tread patterns, PLY options and much more. Trust MonsterTires.com to bring you Skid Steer Tires sorted by size from Dawg Pound Tires and other name brands. Whether you are looking for directional pneumatic skid steer tires or Non-Directional skid steer tires, MonsterTires.com has what you are looking for.